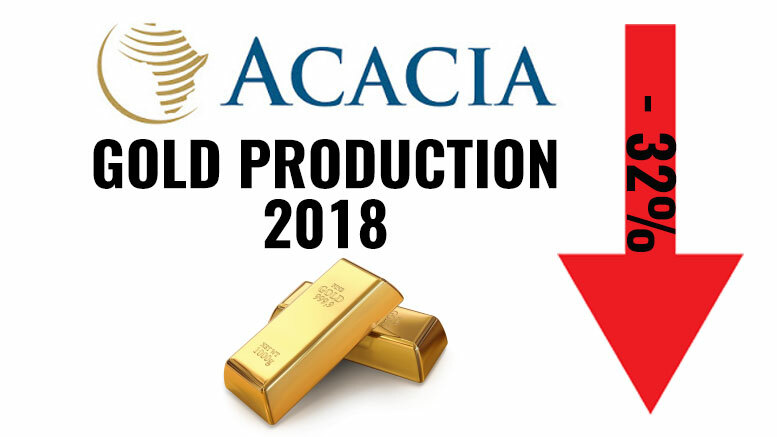 Acacia Mining (LSE: ACA), the largest gold producer in Tanzania, just released its Annual Report for 2018, showing a total gold production of 521,980oz, compared to 767,880 oz in 2017 (-32%). During the same period, revenues reached USD 664m vs USD 752m in 2017, (-11.7%), due to a decrease in gold sales volumes mainly from the Bulyanhulu and Buzwagi mines, while EBITDA reached USD 226m vs USD 257m in 2017 (-12%). The unsold concentrate on hand as a result of the concentrate ban remains unchanged at approximately 186,000 ounces of gold, 12.1 million pounds of copper and 159,000 ounces of silver. Acacia Mining is currently in a raw with the GoT after a presidential committee found in May 2017 that the company allegedly under-declared its exports and eventually presented it with a demand for USD 190 billion in unpaid taxes. The gold miner has always refuted the accusation and has been since in talks with the GoT for a resolution.